You guys have asked sooo many times about details of my bedroom, mostly because it’s where I sit when doing a lot of my Insta Stories, but to be honest I haven’t really touched on it yet because it’s a space I’ve wanted to spruce up for a while now. Most of our decor was from our previous home and had been pretty worn so I wanted to wait until I actually had pieces I LOVED and wanted to share with you all. Not to mention items that were in stock, some of my stuff I just wasn’t able to find anymore.. Okay enough about the old stuff, let’s talk about the new! I don’t know about you but I can be so picky about my bed linens. I try not to be but my bed is a place I need to feel relaxed at the end of a long day so it has to feel luxurious. Not only is it where I sleep but it’s also where we end up having family movie nights and you can find me there finishing up last minute work projects – I get a lot done before bed most of the time. When I found this bedding set from Urban Outfitters I was immediately drawn to the detail in the fabric and knew it was the look I wanted for our bed! Having never ordered linens from Urban Outfitters before I didn’t know what to expect but I was thrilled with their pricing and what all came together! This set included a fitted sheet, comforter and two pillow covers – and the best part was it came in a matching bag for easy storage (which was sooo cute)! When the set came I could not have been happier with the quality! I mean, I actually called Andy to tell him how amazing it was haha! The comforter is nice and plush, just how I like them, and the material was so soft I couldn’t wait to get it all on the bed. I loved the quality of the comforter set so much that I ended up ordering this duvet cover in grey to have a layered look. You guys – this thing feels like a T-SHIRT and is now Andy’s fave! I am loving the look of these two layered together and I can’t even tell you how comfy it is. Best of all neither the comforter or duvet cover show wrinkles – bless it! When I was browsing their site for bedding I saw these ahhh-adorable floor pillows and I HAD to have them! I mentioned our bed is the spot for movie nights and it’s not always so accommodating with three people and two dogs, so I decided to get two of these tufted cushions for the floor to add seating (even if it ends up being for the Laney and Louis haha!). These come in a few different style and color options and Sophie just LOVES them! We’ve actually used them way more than I thought we would and now I can’t imagine not having them. They’ve made their way into different rooms and are so great to have with kids! 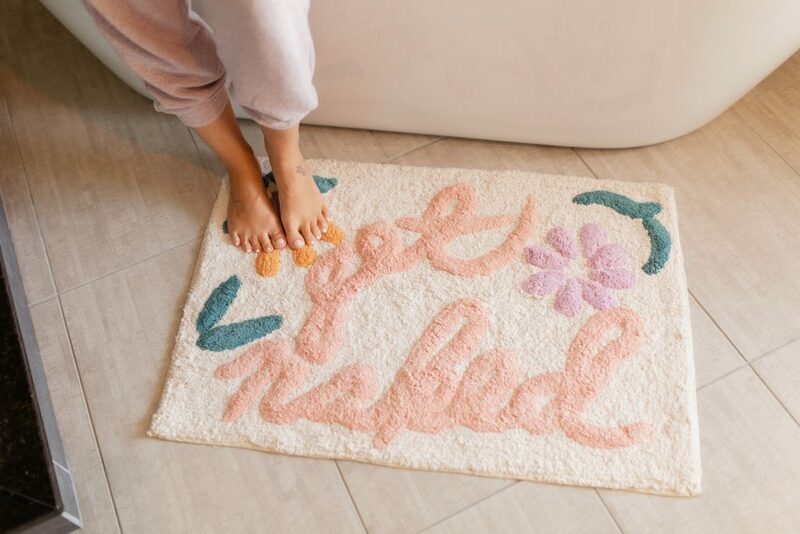 I also found THE cutest ‘Get Naked’ bath mat! And although I wasn’t really looking for one, it’s basically the cutest thing I’ve ever seen!! So yeah, add to cart! If you’re in the market for new home items I would highly recommend taking a look at Urban Outfitters’ selection. They have such unique items all at great prices! I’ve also linked my favorite lounge wear below, because we ALL need pink joggers in our lives! A special shout out to Urban Outfitters Outfitters for sponsoring this post and as always all opinions are my own! Love how you styled your bedroom! Its beautiful! So did you use a down comforter inside your duvet cover? I love the layered look. Ours isn’t down – I think I got this one from Wayfair.. I did’t have the best luck with real down so we opted for the down alternative and it’s been great! Your bedroom is beautiful! Where is the white rug from? I love your Bedroom makeover! I just have one question. Where did you find the bench at the foot of your bed? I love it! I love this look! So relaxing and neutral. Where did you find your fur pillow? Hi Amanda – Where did you get your Euro pillows/shams from? I got the big ones from Crane & Canopy :). Sorry for the late reply!